informs, challenges, soothes and/or berates, and does so with a pleasing vocal cadence and unmatched enunciation. When you listen to IPR, integrity washes over you like lava, with the pleasing familiarity of a medium-roast coffee and a sensible muffin. Click through to listen to the podcast, or read below for more info on IPR. "Thanks for the only proper public radio parody I've ever heard"
We love public radio, and think it serves a vital public service. But come on, it’s also kind of begging to be made fun of, so here we are. 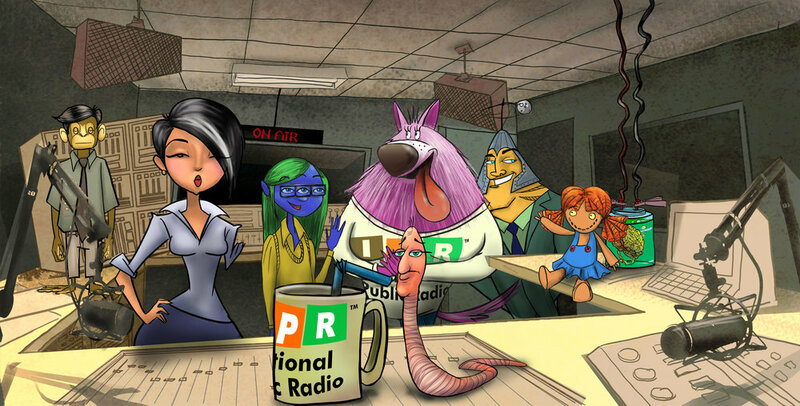 IPR is a public radio parody created, produced, written, directed, and edited by Joe Smith. It contains over 3 hours of original material, and features some extraordinarily talented actors as well as actual public radio on-air personalities (see cast list below). "Still holding my sides and gasping for air between fits of laughter... It is a parody, right? I mean it sounds so, well, real. You've got the NPR sound nailed." The project has been on the back burner since an evil orange hobgoblin ruined the very notion of “fake news” by applying the term to real news he just didn’t like. You can listen to the whole podcast archive here, and subscribe to wait patiently for it to come back when the world is slightly less horrible in this regard. "I just want you to know that the entire staff of the Buffalo, NY NPR affiliate is loving IPR! It's echoing through the hallways!" "OK guys, I absolutely wet myself listening to your 3-minute demo. I want to be a part of this!" There’s also a pilot script for an IPR animated series. You should read it.